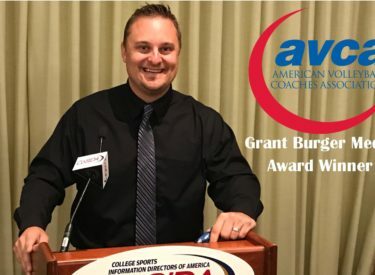 Seward County Sports Information Director Roy Allen was honored by the American Volleyball Coaches Association on Wednesday as he was named the recipient of the ACVA’s Grant Burger Media Award for outstanding coverage of two-year college volleyball. Allen recently completed his ninth year as Sports Information Director at Seward County. He helped Lady Saints Volleyball back to national prominence this year, promoting a Jayhawk West and Region VI Champion Seward squad while along for an 11th place ride at the NJCAA National Tournament. Along with providing day to day coverage and media relations for the Lady Saints, Allen also provided a feature series for Seward Volleyball fans called Above the Net which features a different player each week of the season, detailing their journey to Liberal from all around the world. A CoSIDA award winning journalist, Allen is one of few at the junior college level to provide game notes for Volleyball matches as well as having up to the minute scores, stats, and photos on the Lady Saints website. Allen’s implementation of live video streaming of all of the Lady Saints home games brought over 10,000 fans from around the world ‘to campus’ last season with a Seward team that featured 10 players from overseas in 2017. Allen maintained all of the Seward social media platforms including Twitter, Facebook, and Instagram which have a combined audience of over 3,000 followers. Along with his duties in the office, Allen also made weekly appearancse on the most listened to sports talk show in Southwest Kansas The Sports Guys, working alongside award winning broadcaster Brock Kappelmann to chat about Lady Saints Volleyball and other sports throughout the year. Allen helped launch the Saints Hall of Fame in 2012 and was part of the voting committee that enshrined legendary Volleyball Coach Pat Stangle in 2014 and has ran point on Seward County’s rebranding efforts in 2017, developing an exciting new logo and bringing the first live and in person Saints mascot to life in ‘Louie’. In addition to his responsibilities for Seward County, Allen served as the President of the Two-Year Sports Information Directors of America for the past three years, has served as a CoSIDA Publication Awards Director, and has been the chairman for the KJCCC’s Division I Volleyball Player of the Week committee, as well as being a voting member on the Division II committee. “I am extremely humbled by this honor from the AVCA” Allen said. “There are so many deserving candidates out there, including a number of them in our own conference, to be chosen as the lone winner at our level is very special to me. With an unbelievable staff and fantastic student-athletes in all of our sports, I truly don’t ever feel like I am working when I am around them. I enjoy every minute that I am able to support them in these different ways and look forward to continuing to do so in my new role as Interim Athletic Director” he continued.